Most hunting chaps designed to stop poisonous snakes are heavy, inflexible, and bulky. Using a mere 6 oz. fabric, TurtleSkin SnakeArmor chaps are one-third the weight of other hunting chaps yet are tested to repel even large rattlesnakes, cactus thorns, and briars. TurtleSkin SnakeArmor's patented technology features the tightest weave ever achieved with high-strength fibers. U.S. Patents 5,565,264 and 5,837,623 as well as other patents pending. TurtleSkin SnakeArmor Below the Knee Protection Snake Chaps are made with a soft outer shell, and the lightweight protective TurtleSkin SnakeArmor material covers a full 16 inches from your ankle up. 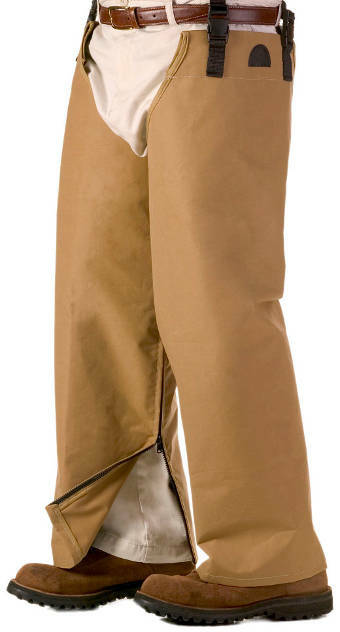 They are the lightest and softest snake chaps on the market. The outer shell is water resistant and breathable, keeping you dry and comfortable.